NEW FOUNDATION WAAHOOO!! I'm a foundation junkie, always excited to see a new launch. Especially when a brand launches an inclusive range of shades so everything can try. I don't have much experience with Benefit foundations so I was super curious to try the Benefit Hello Happy Soft Blur Foundation. have a full review and wear test coming on my YouTube Channel along with another blog post that will compare my shade to some other popular shades. 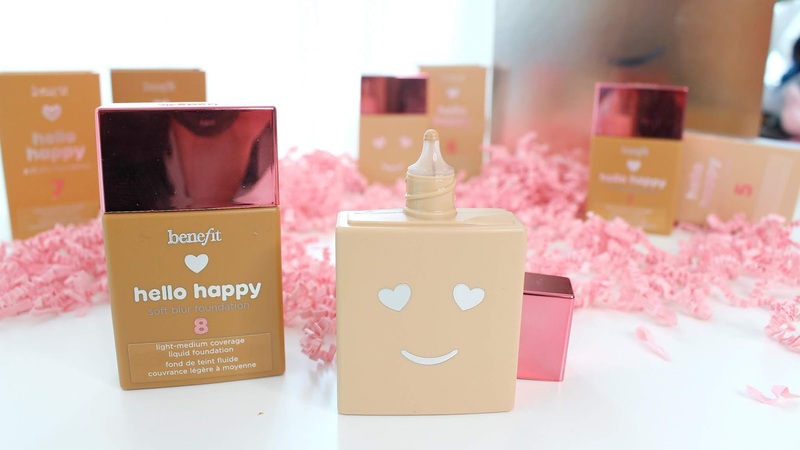 The Benefit Hello Happy Foundation is available at Sephora for $29 USD/$39 CAD. It contains 1 fl oz which is the average size of a foundation and comes in some super cute packaging. As to be expected from Benefit. There are 12 shades in the line which I'm super happy to see, Benefit has always fallen short when it comes to creating complexion products for deeper skin tones. Although 12 shades isn't huge it's a true range, aka light to deep - that works for me!